We are still learning about cats. Every day, Rosie The Boy Cat and Morti do something new. The things they do can be entertaining, or annoying, or surprising, depending on what it is that they do. One of the things that Rosie does that surprises us is that he likes to bring us gifts. In the beginning of his stay here, I could be sure of stepping on his toys because he would bring all of them to me during the night and put them by my side of the bed. As he grew he started going outside during the day. Pretty soon, he would come to the door, and make a new sound that wasn’t a meow. It was more like a howl, but not as intense as that. When he makes that sound, he is letting us know that he has brought us something he has found. 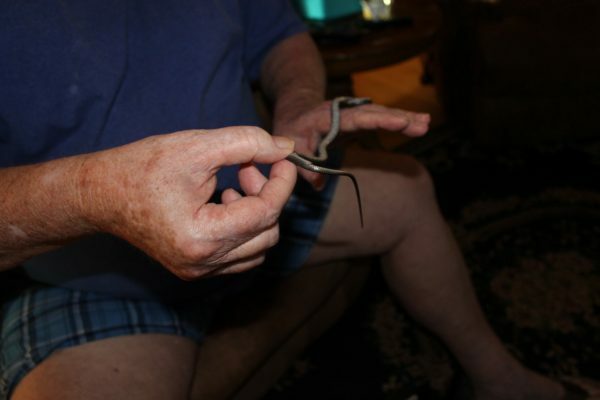 It was just a baby snake. 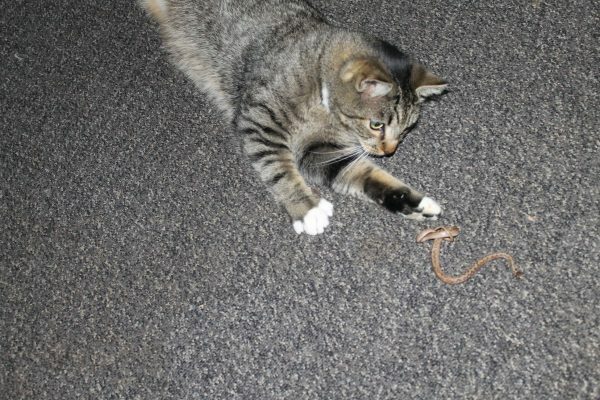 One day, he brought us a little snake! That snake must have been scarred for his life! It was still wiggling though, and each time it did, Rosie would jump at it again. We thanked Rosie for the gift, but took it outside. I’m not having a snake in the house! Nice name (same as me)! 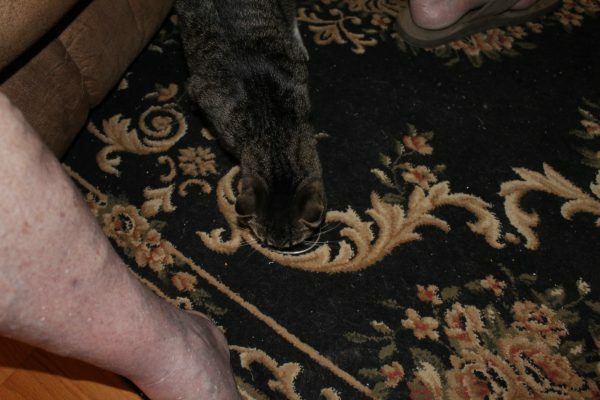 I remember growing up our cats would do this, esp as we had little snakes like that. One time the cat dragged home an owl that had been dead for months, was very proud of his present for us! Been there, had the gifts, too. Actually still in that stage with seven indoor/outdoor cats! We’ve been gifted with their idea of food which is usually a bird, different kinds of bugs, lizards and snakes of all sizes. I put my foot down with they started bringing ground rattlers for me to cook! I’ve learned just how high I can jump and what awful ‘ugly words’ I can spit out after receiving quite a few of their gifts. ha.. But I always remember to thank our kitties for wanting to help with our food supplies, but we don’t have the desire to eat those things even though it’s the sweet thought(s) that count. They obviously love us and want to help feed us like we feed them. Thanks but no thanks! One of these days I’ll remember to shut the back door or buy a screen door with a strong latch! ha.. The fun has only just begun Fab Grandma!